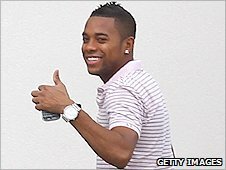 Manchester City striker Robinho has moved to AC Milan after signing a four-year deal at the Serie A club. The Brazil international had a medical with the San Siro side on Tuesday but a fee has yet to be announced. A statement on the AC Milan official website read: "AC Milan announces it has acquired Robinho on a permanent deal from Manchester City." The 26-year-old joined Manchester City for a British record fee of £32.5m from Real Madrid in the summer of 2008. The former Santos player arrived at Eastlands in dramatic fashion on the final day of the transfer window, on the first day of owner Sheikh Mansour bin Zayed al Nahyan's reign at the club. However, the playmaker struggled to make an impact at the Eastlands outfit and was loaned to Brazilian side Santos in January 2010. Robinho, who rejected a move to Turkish club Fenerbahce earlier this summer, will join fellow countrymen Ronaldinho and Alexandre Pato at the Serie A club. Meanwhile, Manchester City striker Felipe Caicedo has joined newly-promoted Spanish side Levante on a season-long loan deal.